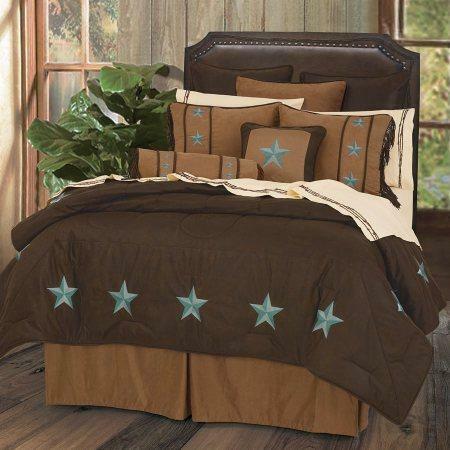 Chocolate and Turquoise together makes a beautiful statement on this gorgeous western bedding set! The western atmosphere screams at you when you look at the picture, let alone when you walk into a bedroom and see it in person! 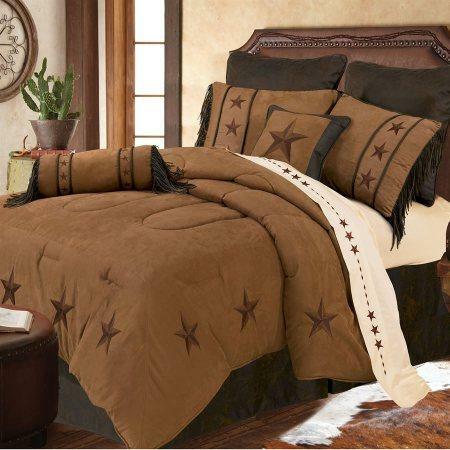 The doe-soft comforter, in quiet shades of brown with turquoise embroidered stars, will transport you to dreams of the rugged West as you sleep in the feather softness of this bedding set. Coordinating pillow shams, neck roll, star design cushions, and dust ruffle complete the look. Additional color combinations are available for this set. Search for Laredo to find all Laredo products in the collection.